The objective of this chapter is to work through a detailed example designed to demonstrate dynamic table view creation within a storyboard using table view prototype cells. Once this topic has been covered, the next chapter (entitled Implementing iPad TableView Navigation using Xcode Storyboards) will explore the implementation of table view navigation and the passing of data between scenes using storyboards. Start Xcode and create a single view application. Name the project and class prefix TableViewStory and make sure the Use Storyboard and Use Automatic Reference Counting options are selected and that the Device Family menu is set to iPad. At this point we have a template project consisting solely of a storyboard file and the standard app delegate code files and are ready to begin building a storyboard based iPad application using the UITableView and UITableViewCell classes. We will be declaring the Table View Controller instance within our storyboard as being a subclass of UITableViewController named CarTableViewController. At present, this subclass does not exist within our project so clearly we need to create it before proceeding. To achieve this, select the File -> New -> File… menu option and in the resulting panel select the option to create a newObjective-C class. 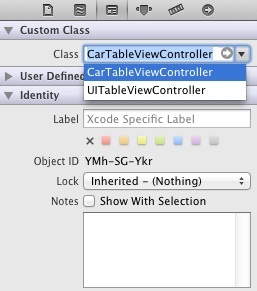 Click Next and on the subsequent screen name the class CarTableViewController and change the Subclass of menu to UITableViewController. Make sure that the Targeted for iPad option is on and With XIB for user interface option is turned off and click Next followed by Create. 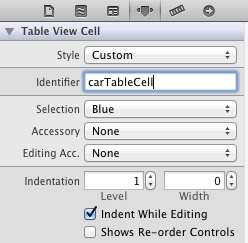 Within the Table View Controller added to the storyboard in the previous section, Xcode also added a prototype table cell. Later in this chapter we will add two labels and an image view object to this cell. In order to extend this class it is necessary to, once again, create a subclass. Perform this step by selecting the File -> New -> File… menu option. Within the new file dialog select Objective-C class and click Next. On the following screen name the new class CarTableViewCell, change the Subclass of menu to UITableViewCell and proceed with the class creation. 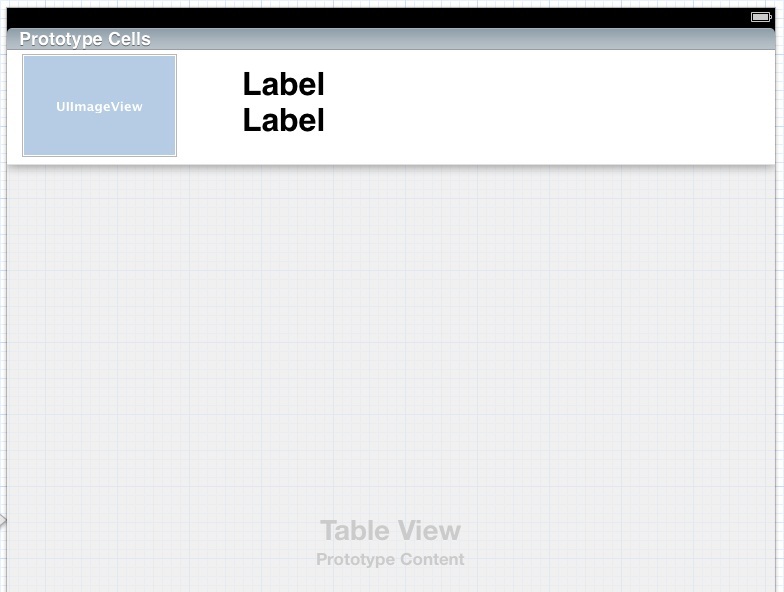 Similarly, select the prototype table cell within the table view controller storyboard scene and change the class from UITableViewCell to the new CarTableViewCell subclass (note that the storyboard will need to be zoomed in order to select the cell). With the appropriate subclasses created and associated with the objects in the storyboard, the next step is to design the prototype cell. 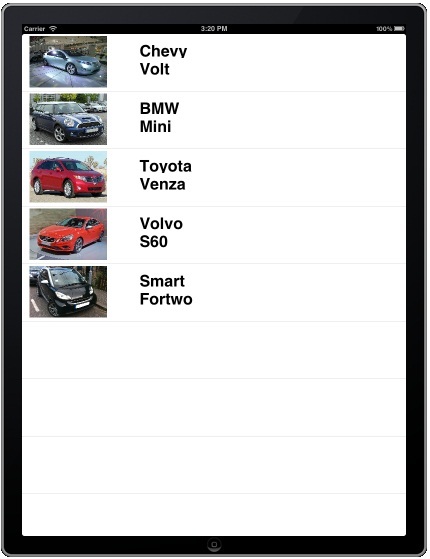 Repeat these steps to connect the carModels and carImage outlets to the second label and image view objects respectively. Now that the storyboard work and code modifications are complete the final step in this chapter is to run the application by clicking on the Run button located in the Xcode toolbar. Once the code has compiled the application will launch and execute within an iOS Simulator session as illustrated in Figure 20-7. Clearly the table view has been populated with multiple instances of our prototype table view cell, each of which has been customized through outlets to display different car information and photos. The next step, which will be outlined in the next chapter entitled Implementing iPad TableView Navigation using Xcode Storyboards will be to use the storyboard to add navigation capabilities to the application so that selecting a row from the table results in a detail scene appearing to the user. The Storyboard feature of Xcode significantly eases the process of creating complex table view based interfaces within iOS applications. Arguably the most significant feature is the ability to visually design the appearance of a table view cell and then have that cell automatically replicated at run time to display information to the user in table form.